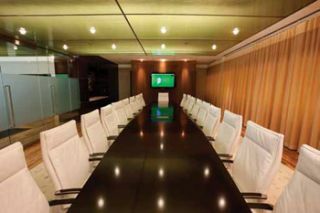 Global Forex Trading relies on Crestron DigitalMedia and touch screens for boardroom control, high-definition videoconferencing, and more. Are you on the right road to pristine video? Video formats continue to expand quickly and reverse the visual mindset for integrators, as consumer content and display options increasingly dictate expectations in commercial installations. With more formats come more chances for industrial-strength video to look better than ever—or go excruciatingly wrong. But integrators who are aware of opportunities and hazards in video routing (also referred to as “switching” in non-digital broadcast applications) can increase the odds of a great outcome for their clients, in the present and far into the future. Dan Holland, vice president of product marketing for PESA, manufacturer of products including the Vidblox converter/extender module, agreed. “If you look at the landscape of commercial AV routing and matrix switch solutions now and on the horizon,” he said, “it is an overwhelming deluge of acronyms, signal formats, and connectivity types. Years ago, if you had a clear understanding of analog video it was pretty easy to just find the lowestcost vendor and plug in the router. Fast-forward to today and things have changed dramatically. Global Forex Trading pipes high-definition entertainment media into its cafe area via Crestron DigitalMedia. PESA equipment is in use at the CMD Command Center inside CheyenneMountain Air Force Station serving NORAD and USNORTHCOM. Crestron CresFiber 8G is graded-index multimode fiber optic cable with extended bandwidth for use with DigitalMedia 8G fiber solutions, as well as standard DigitalMedia fiber and Crestron HDMI over fiber. CresFiber 8G is graded-index multimode fiber optic cable engineered by Crestron to deliver extended bandwidth for the reliable installation of fiber-based Crestron systems. CresFiber 8G is tested to wavelengths up to 1,550 nm, surpassing the performance of previous generation CresFiber as well as generic OM2 and OM3. CresFiber 8G provides four individually jacketed fiber strands within a single reinforced outer jacket. The ultra-thin VGA/QXGA with stereo audio tri-shield, fully wired cable with interchangeable mounting from QVS allows installation in the tightest areas. The cable includes removable thumbscrews and that can be replaced with included stand-off screws and can be mounted on a face plate. It is fully-wired for maximum compatibility with both PC and HDTV/projector applications. The stereo audio cable color-coded connector extends 17 inches on one end and 22 inches on the other end. These cables utilize RedMere’s lowpower PRA1602 chips to transmit high speed HDMI with ethernet over an ultra-thin cable that is easily concealable in any commercial environment. The RedMere MagnifEye active technology eliminates the need for heavy-gauge copper, making the cables extremely light, thin, and portable. Atlona LinkConnect thin HDMI cables measure just 3 mm in diameter, making them approximately 65 percent thinner than normal HDMI cables. SheerWire by Gepco Video Cables are made using the same techniques and materials used in professional, studio-grade video coax. Every SheerWire video cable is built to exacting electrical and mechanical specifications, then comprehensively tested and verified. As a result, the video image is transmitted with minimal loss or errors. SheerWire video cables include broadband, high-definition, and CCTV coax; component video RGB; as well as camera triax and low-skew UTP. Clark Wire and Cable’s CD Series of HD/SDI coaxial cables for digital and high definition video formats are available in four sizes ranging from 23-gauge miniature to lowloss 14 gauge RG11 type coax. The CD series delivers broadcast-grade performance for demanding mobile production, studio, commercial AV, and large venue HD/SDI systems. Designed for precision electrical performance in high-bandwidth applications, the CD series delivers the critical electrical characteristics required for 1.5 Gb/s and 3 Gb/s uncompressed video transmission. The Extron LockIt is a cable-lacing bracket for securing HDMI cables to the host product’s input and output connectors. The Extron LockIt provides a simple and inexpensive way to secure HDMI cable connections, helping to maintain signal integrity and streamline troubleshooting by ruling out loose cable connections as the source of the problem. Gefen’s DisplayPort Extreme extenders come in pre-terminated lengths of 75 feet (23 m), 100 feet (30 m), 150 feet (45 m), 210 feet (64 m), and 300 feet (91m). Equipped on both ends with DisplayPort connectivity, these cables offer plug and play operability, using power to propel high-resolution video with audio up to 300 feet in distance. Both single or dual link video modes are supported up to 2,560 x 1,600 resolutions. The use of fiber optic components guarantees any resolution can be delivered in a pure digital format without compromising signal integrity. HDCP compliance is supported. The TruLink high speed HDMI active optical cable (AOC) distributes high-definition AV from source to display in various commercial venues. The optical fiber construction between the connectors provides a flexible, durable cable assembly. It supports full 1080p resolution up to 20 meters and will be available in lengths up to 100 meters. The TruLink cable diameter is smaller and more flexible than copper, enabling easy installation for tight in-wall spaces. Designed to overcome the barriers of sending digital DVI signals over copper wires, DVIGear’s extended length fiber optic cables provide signal fidelity and transparency over a range of input resolutions, with cables lengths up to 100 meters. These cables utilize high speed fiber-optic converters integrated within each connector that convert the digital input signals into optical pulses, and then back again at the display. The cable material is an innovative hybrid design consisting of four high-speed glass fibers and 5 copper wires, which offers a high degree of ruggedness and flexibility. Liberty AV’s active, optical HDMI high-speed cable assemblies offer quality and performance at distances of up to 328 feet (100 meters) without a need for conversion or additional power if the HDMI sink consumes 15 mA or less. Available in various lengths up to 328 feet, the high-speed cable assemblies draw power directly from any HDMI port. Utilizing both fiber optic and copper cabling in a UL-listed plenum configuration, the product line incorporates a design relying upon the ultra-miniaturization of the optical-to-electrical conversion process within the HDMI connector footprint. The 1694WB water blocking cable has a gel-filled layer on the braid that helps prevent water intrusion. The jacket is constructed from high-density black polyethylene, among the hardest jacket compounds available. This cable is appropriate for use underwater, in a hurricane, or any other application requiring super-ruggedness. The 1694WB takes the same stripping and crimping tools as regular 1694A, as well as the same connectors. The internal performance in high-definition or 3G (1080p/60), such as attenuation, effective distance, or return loss, is also the same as the 1694A. The DGKat series shielded twisted pair category cable from Kramer delivers HDMI and DVI digital video signals over long distances. DGKat are RoHS compliant and available in bulk spools of 1,000 feet and 328 feet. Three cable types are available: the BC-DGkat524, which is F/UTP constructed with 24 gauge conductors that have an overall outer shield; the BC-DGkat623, which is U/FTP designed with 23 gauge conductors where each pair is individually shielded; and BCP-DGkat724, an S/FTP designed, plenum rated cable constructed with 24 gauge conductors in individually shielded pairs and an overall outer shield.